Special 5-5 is the fifth level of Special 5 in Super Mario 3D Land. It is based off of World 6-3. The player starts out in a room with three Warp Boxes, they must go into the one on the far right to continue with the level. The next room contains several Tail Goombas, a Crate that contains a Statue Leaf and two Warp Boxes. The Warp Box on the upper level of the room leads to the next room which contains a Piranha Plant, several Fire Piranha Plants, some ? Blocks that contain a Fire Flower and a Poison Mushroom and two Warp Boxes. The Warp Box in front of the bookcase leads to the next room where the player will encounter several Dry Bones and two Warp Boxes. The Warp Box on the upper level leads to the next room. The next room contains the Checkpoint Flag, a Flying ? Block, a Goomba and two Warp Boxes. The Warp Box on the upper level leads to the next room which has several Prongos, a ? Block with a Boomerang Flower, a Brick Block that contains multiple coins and two Warp Boxes in it. The Warp Box that is floating leads to the next room and this room has several Peepas, a Goomba, a ? Block with a Statue Leaf and two Warp Boxes in it. The Warp Box that isn't in the circle of Peepas leads to the next room which contains several Boos, a Goomba and two Warp Boxes. The Warp Box in the bookcase leads to the final area. The final area contains some platforms that can be used to reach the Goal Pole. 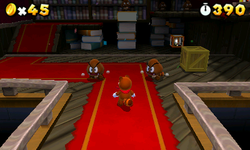 Star Medal 1: The player needs to defeat the Goomba in the room with the Checkpoint Flag. Star Medal 2: The player needs to defeat the Goomba in the room with the Peepas. Star Medal 3: The player needs to defeat the Goomba in the room with the Boos. This is the only level in the game where Star Medals are obtained from defeating enemies.